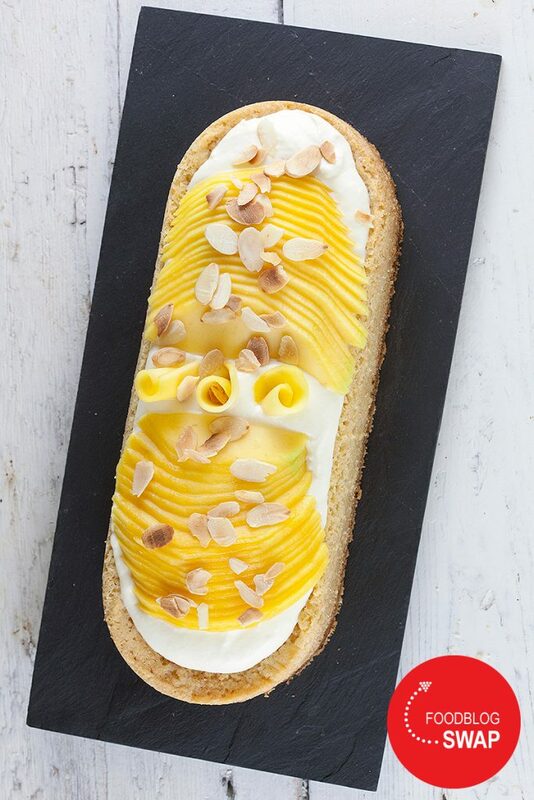 These white chocolate and mango tarts are made with Dutch 'sloffendeeg', a crunchy cookie-like crust. Filled with a delicious homemade almond paste. MELT 25 gram dairy butter with 75 water and 80 gram sugar. ADD 50 gram flour all at once and cook it for a few minutes. ADD the almond flour and stir well. 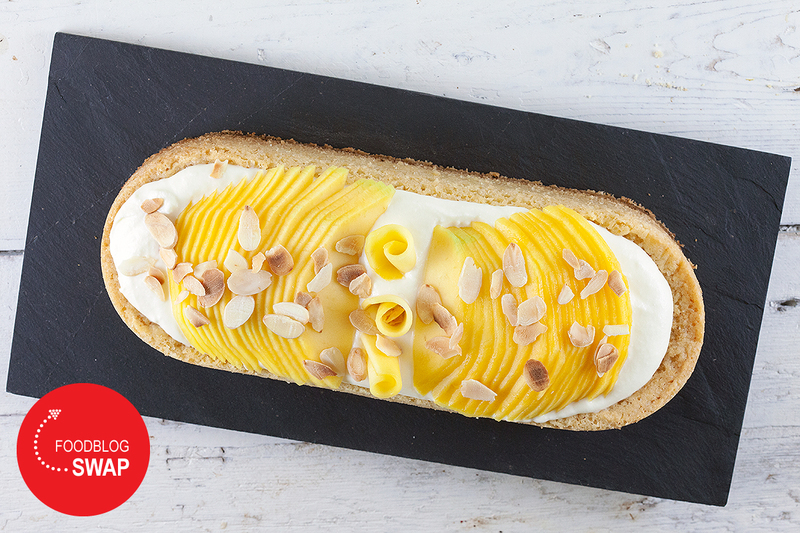 Let the almond paste cool off while you create the ‘sloffendeeg’. You can knead the dough with a standmixer or by hand. COMBINE 200 gram flour with 145 gram sugar and 2 gram baking soda. DIVIDE 145 gram dairy butter into cubes and gradually add them to the flour while you keep on kneading. ADD the egg yolk and tablespoon of lemon juice and knead until you’ve reached a dough ball. WRAP the dough ball with cling film and refrigerate for about half an hour. PRE-HEAT the oven to 175 degrees Celsius or 350 degrees Fahrenheit and line the baking tray with parchment paper. ROAST a small handful of almonds shavings in a dry skillet. Use a rolling-pin to create a dough of about 1 cm thick and transfer it to the oven tray. Use the oval-shaped ring to create an oval-shaped piece of dough, you have to bake it inside the ring. Use your hands to roll the almond paste into a piece that fits inside the oval shape, but keep the edges free. This way the dough will rise on the edges to enclose the almond paste in the middle. BAKE the tart for about 20 minutes and let it cool off completely inside the ring. 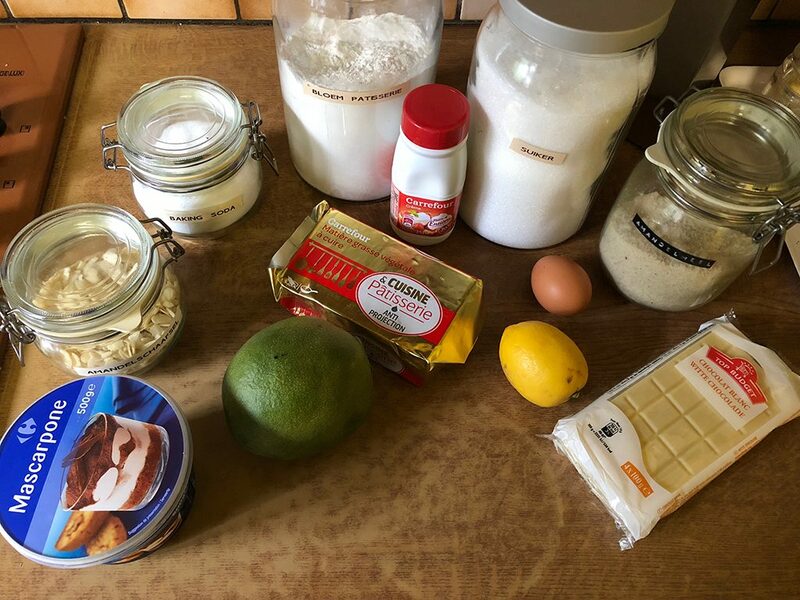 MELT the white chocolate, you can use bain-marie or a microwave to do this. BEAT the heavy cream and combine with mascarpone in a medium-sized bowl. If the chocolate has cooled down a bit you can stir it into the cream and mascarpone. PEEL the mango and divide into thin slices. 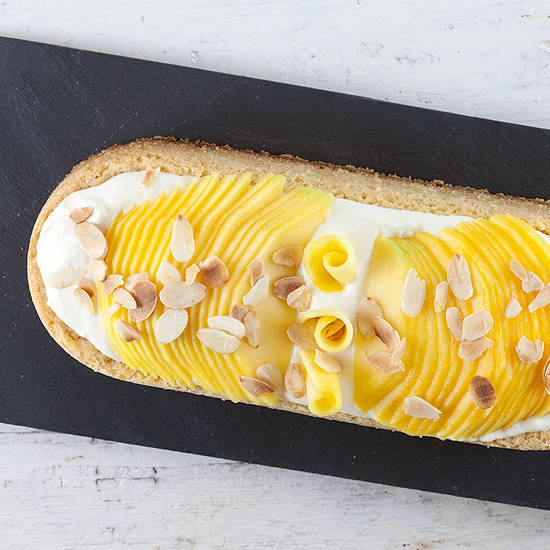 DIVIDE the white chocolate cream over the tart and FINISH with mango and almond shavings. Enjoy!